As Robert E. Lee’s “right hand”, the death of Thomas J. “Stonewall” Jackson was a crushing blow to the Confederate army. But was it pneumonia? Following his greatest victory at the Battle of Chancellorsville on May 2, 1863, Confederate Lt. Gen. Thomas J. “Stonewall” Jackson was scouting ahead of the lines with members of his staff when tragedy struck. In the pitch blackness of the early spring evening, Jackson and his men were mistaken for Union cavalry and fired upon by their own side. Jackson sustained a severe wound to his upper left arm, necessitating amputation. Upon hearing the news, victorious General Robert E. Lee remarked, “He has lost his left arm, but I have lost my right.” Lee’s words proved prophetic. 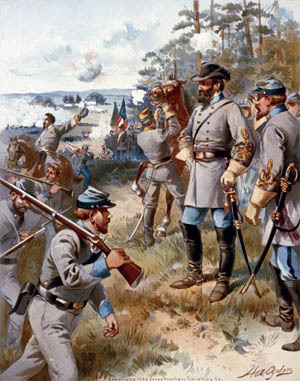 Eight days after the amputation, Stonewall Jackson was dead. Jackson tolerated the surgery well despite his earlier significant blood loss. At 3:30 the following morning, Major Alexander “Sandie” Pendleton arrived at the hospital to obtain orders for Maj. Gen. J.E.B. Stuart, Jackson’s replacement as corps commander. By 8 pm, the pain had disappeared and Jackson seemed to be doing well. The following day, fearing Jackson’s capture by nearby Federals, Lee ordered McGuire to remove his patient to Guiney Station, 27 miles away. After their arrival, McGuire dressed Jackson’s wounds and found them to be healing well without signs of infection. Jackson seemed satisfied with his progress and inquired how long it would be before he could return to the field. At 1 am, however, he suffered another bout of nausea and asked a servant to reapply a wet towel to his abdomen. When he awoke in the afternoon and saw several surgeons standing around his bed, he said, “I see from the number of physicians that you think my condition dangerous, but I thank God, if it is His will, that I am ready to go. I am not afraid to die.” Following another difficult night, the general awoke on Sunday, May 10, completely exhausted. It was apparent to everyone that he could not last the day. Tags A.P. Hill, Alexander Pendleton, Battle of Chancellorsville, Confederacy, Hunter McGuire, J.E.B. Stuart, Robert E. Lee, Stonewall Jackson, Union Army.